Can you Trust the Alpha Sustainable Seafood Raters?? Do we really need another rater of ratings? The alpha raters of sustainable seafood for any U.S. consumer are the Monterey Bay Aquarium (MBA), Greenpeace and the Blue Ocean Institute (BOI), along with the Marine Stewardship Council, WhichFish, Fishwise, Seachoice, and the Environmental Defense Fund (EDF). The next few posts compare ratings and examine raters for the quality of their ratings. This series of posts has several purposes, only one of which is to assess different ratings for quality and differences. The most important purpose is to highlight the implications of different seafood ratings. Most raters do not explicitly address the longterm ecological implications of their ratings. For example, if most of the seafood that we consume is imported and most of that is farmed, and the fish farmed using methods of fully recirculating closed systems are rated highest, and these farms are energy intensive, and the source of that energy is fossil fuels, what might be inferred about the longterm-ecological sustainability of farmed fish? Each rating is an indicator of phenomena that go immeasurably beyond which foods should be consumed. Ratings reflect a status relevant to some baseline as well as some change in one or more species or habitats in one or more ecosystems that affects directly or indirectly, now or later, the quality of our lives. Baselines shift. Our concept of what is good and acceptable shifts with the reference baseline. But the tendency to want the absolutely best quality of life remains constant. As a generality, most consumers consider a seafood rating primarily as a guide as to what to buy or not to buy for dinner. The menu changes, the consumer doesn't, but the implications do.This series of posts is about consumer decisions that affect both objective reality and what we judge to be the best of 'the good life'. So yes, another rater that addresses distinct aspects of rating might be useful. Quality of life depends fundamentally on the vibrancy of a hugely complex network of ecosystems, which in turn is massively affected by what and how we consume. As each of us is a consumer of some thing, each of us is responsible for what we consume. This responsibility is based on decisions that are complex and challenging. When marine animals such as salmon, only recently thought to be abundant and healthy (relative to a common base-line), are rated red-avoid, we can either ignore the warning, avoid the seafood, take the time to see which salmon species fished by which method in which areas should be avoided, or consider a red-avoid to be a canary in the coal mine, alerting us to something significant and mandating immediate action if we care about survival.This coal-mine has only one, unattractive exit. So another pervasive goal for this blog is to encourage consumers to share responsibility for the sustainability of food in general, both terrestrial and marine-sourced. Consumer responsibility is neither small nor simple. While no one wants to consult ten possible ratings for shrimp just to enjoy an appetizer of gambas al ajillo, that may be what is now required for stewardship. Consumers can, at the least, take responsibility by demanding that their fish marketers post sustainability information for each fish (refers to finfish, shellfish, etc.) and boycott those who fail to do so. Another outcome might be to raise awareness of some of the short-comings of present rating-systems. All of the raters use an ecologically based definition of sustainability, which is not the classic triple bottom line of profit, people, and place, but which is consistent with the framework of this blog (Evolutionary Aesthetics). But the keystone rater Monterey Bay Aquarium omits energy considerations in their ratings of farmed food. More mention of why this is a major concern below and in later posts, but what is important here is that most other raters base their systems on the MBA model and criteria. If this is flawed, better models need to address this concern. A semi-final objective is to consider which of the raters provides actionable information that is most relevant to my niche audience, the Central Coast consumer of more or less high-end seafood and local best quality wines. The overarching objective is to reduce confusion and support sound decision-making by conscientious consumers. The two main approaches to supporting ecologically sound seafood choices are certifications and recommendations. This post examines recommendations, which are for the most part directed towards consumers, the primary target audience of this blog. Einstein, the master of complexity, advised, "Make everything as simple as possible but not simpler." This is a truth well applied to the sustainability of seafood. Recently, producers, markets, and organizations have been trying to make choosing the best (most sustainable) seafood as simple as crossing the street using a traffic light system; Green symbols always mean go, red mean stop. The symbols change among raters, but the color coding is 100 % consistent.Sustainability, however, is neither a simple concept, simple process, nor readily attainable simple goal. What happens to decision-making when simpler choices are not possible? For purposes of Reward in the Cognitive Niche's investigation of ratings and raters of sustainable seafood, just two sea animals will be compared: squid and shrimp/prawns (used interchangeably). Both can be considered keystone species for consumer decision-making. Shrimp were selected for examination because first, shrimp is the number one seafood consumed in the U.S., so very important economically, socially, and environmentally; and second, ratings of shrimp sustainability are confusing, because shrimp production is complex. Some shrimp are rated excellent choices and others to be avoided by anyone trying to do the right thing by the environment. Some are wild-caught by methods of varying degrees of acceptability but most are farmed, and most of the farmed shrimp are imported (85%). The U.S. imports most of the seafood consumed, so the sustainabiltiy differences between imported and U.S. is not to be dismissed. Most though not all imported shrimp are considered bad choices. Simplistically, that is a minimal guide: avoid shrimp farmed from outside the U.S. The taxonomic specific is important for multiple reasons, among which is the following: each subspecies appears to be adapted to specific habitats. Any change in those habitats could result in the extinction of a species. The loss of a species is the loss of quality of life, since Reward in the Cognitive Niche (RCN) uses biodiversity as an indicator of quality of life. Further, some species of squid in some geographical areas have healthier populations than others. Longfin squid tend to be rated best choices, while market squid when rated at all tend to be rated chartreuse or yellow, meaning there are some concerns. Squid tend to be of lower concern than many other species because they have short lives (less than one year) and produce prolifically, as many as 30 million eggs during a lifetime. Squid issues are not so much overfishing as damage to environments by fishing methods used for capture. MBA the mother of most seafood raters. Ratings exclude energy issues. So Fully recirculating Systems are generally given high ratings, although high energy inputs may be required for operation. Giant River Prawn, Malaysian Prawn, farmed in U.S.
Squid: "The Monterey Bay Aquarium lists all squid as "Best Choice" and "Good Alternative", and the MCS rates squid as 2-3. FishWatch and Greenpeace have no data. Data is lacking about Pacific squid." Shrimp: "The Monterey Bay Aquarium rates both wild caught and farmed white shrimp from the US as "Best Choice"/"Good Alternative", but shrimp from other sources as "Avoid". FishWatch states that population levels of wild white shrimps are "high". The Wikipedia page on shrimp farming lists a large number of environmental issues associated with the practice. The conclusion is that it is the means of farming rather than the source that makes the difference. (The MCS and Greenpeace have no data.) "
"Large pink prawns. Fished tiger prawns are not environmentally sustainable. Prawn farming may cause: destruction of habitats through conversion into pond systems, nutrient runoff, freshwater lakes being turned into saltwater and the spread of disease to wild prawns. Prawns require a lot of fishmeal that tends to come from unclear sources." Large pink prawns. Organically certified farms reduce the environmental damage that may be caused by prawn farming. longfin squid from mid-Atlantic, U.S. caught wild with otter trawl. rated green. avoid all farmed shrimp except from U.S.
"both farmed and wild caught, are warm water species. About 80% of the world's wild caught shrimp is tropical." U.S. farmed shrimp is a best choice. Most of the top-rated raters collaborate or reference each other, so there are few significant differences in the ratings. Ratings for good choices vary between color-codes of green or chartreuse, best or good alternatives, which may or may not indicate significant differences in ecological sustainability. As far as I can discern, no rater includes energy costs in its farmed seafood ratings. So my advice is to go to MBA and use their Seafood guides and advocate for more inclusive criteria that will affect future generations of consumers. Their research is prodigious. Remember that MBA excludes energy costs. A second more time-consuming approach would be to omit from the menu any seafood rated unsustainable by any of the above. Look in the extreme right column of the table above and avoid those shrimp. Look in the middle column of good choices and choose those fish with no bad ratings. As one example: Whichfish and Fishwatch rate wild-caught pink shrimp as unsustainable., while for the MBC and BOI pink is a best choice. Err on the side of caution and avoid fish with red ratings regardless of the rater. To simplify, avoid imported shrimp. Consider wild-caught shrimp from Oregon or Alaska good choices. 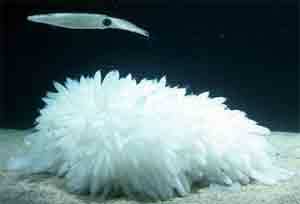 Prefer longfin squid if given a choice. Market squid are considered relatively good choices. More on this next post. Below is a list of all raters taken from the URI SustainableSeafood Initiative. Raters pass judgment on their objects. On the one hand, judges are honored for their willingness and ability to pass good judgment. While the previous post suggested that each of us is born to judge, political correctness has cast a shadow over judgment, somthing that also diminishes the value of the enlightening process of coming to judgment. That said, the earth itself may be the final judge of the goodness of all living things, so perhaps every object we get from the earth should be addressed as 'your Honor'. Perhaps judgment too should be reconceptualized in 2012 as potentially honorable action. Eating down the food chain, the topic of numerous previous posts, implies major alterations in all levels of every chain we fish and eat down. Eating from lower levels indicates that the upper levels are effectively gone. Levels are composed of networks of ecosystems, and for each level there is a food chain reaching down almost as far as the core of molten rock. When an entire level is gone, all the species at all lower levels are affected in ways hard to predict. What we consume has irreversible impacts on the number and genetic variability of species that will survive and populate our lists of biodiversity. Biodiversity becomes a proxy for this blog for quality of life. When a species becomes extinct, as a rule, we will experience this sooner or later as a loss in quality of life. Or so I argue. Net: Which seafoods can be reliably considered best choices for both top quality and ecological sustainability? For this blog, which is framed by evolutionary aesthetics principles, sustainable is always qualified by the adverb ecologically sustainable. That means that the social and economic aspects of production and consumption are not values in the optimization process of ecological sustainability. Global pleasure emerges from a process necessarily entailing biodiversity, clean air and water, healthy food and drink,and resilient, niche-rich, resource-rich, renewable environments. The nest post will examine farmed fish and some of the issues not sufficiently addressed by any of the above raters.